Well – here we are again – it’s Friday. I feel like this week has been kind of a laugh when it comes to the whole fitness routine. Granted, I have walked 3 of the 4 days so far this week…but nothing too impressive. I did get in 3+ miles on Monday…which definitely coincided with the luxury of being off for my “birthday”. I took a big ol break from working out on Tuesday – because it actually WAS my birthday and between work and supper and book club, I wasn’t home on Tuesday until 8:30 at night. And who wants to eat a birthday cupcake and then go walk in the dark? Not this chick. At least…not on Tuesday night. Wednesday was a rough day for me – I didn’t feel so great the entire day and so while I still walked, it just was a mile because I got halfway down the road, broke out in a cold sweat and felt a little puny, so I figured I’d better seek a place to sit down…and the side of the road didn’t seem safe. Thursday night was almost as pitiful; as soon as I came in from work we went to buy groceries, then we cooked supper and ate and by the time that was all said and done…even though it was only 7:30, it was dark. Daylight Savings Time – it’s gonna be interesting y’all. I walked a mile…in the parking lot of the golf club. I haven’t hopped on the scale this week – maybe I’ll wait until I’ve conquered my Saturday and Sunday outings to see what it looks like…although I was worried last week and still dropped two pounds! I’ve definitely got to get it together – tis the season for candy, turkey and numerous delicious (and usually bad for you) things to eat. I’ve got to keep it together going into the next few months. So – no picture this week. Maybe I’ll have one next week…maybe I won’t. I’ll post another eventually; I know you’re all waiting with baited breath. Ha! 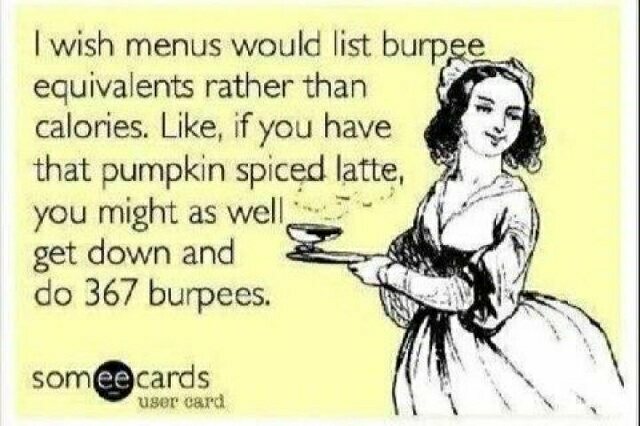 Until next week – avoid those PSL’s – unless you actually enjoy doing burpees….